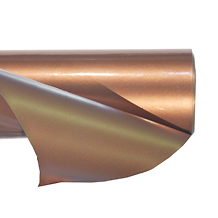 Membrane composed of flexible PVC and a polyester reinforcement with a copper look. The membrane is distinguished by a very high resistance to weathering (UV-rays, ...), humidity, heat and with a high resistance to puncture. Used as single layer waterproofing where a copper look is desired. The upper side is copper coloured.